This Thanksgiving was one of those long weekends that seemed like a vacation. Invitations arrived unexpectedly. Everything lined up perfectly for three solid days of non-stop mirth and merriment. We received an invitation to join a young American friend and his family to celebrate his recent graduation from Simon Fraser University with a Master's degree. We were tickled to be included! Our friendship with this family goes back to 1987 when we moved to Seattle for Joe to study statistics at the University of Washington. We were neighbours in student housing. We quickly became close friends spending lots of time together. Since then we have visited back and forth to wherever our families were living. We vacationed together for many years when our kids were small. And now our babies are grown and doing amazing things with their adult lives. Jobs, marriages, university degrees, children of their own, living on the other side of the continent, successfully standing on their own two feet. We parents are proud of who our children have become since those salad days living on the shores of Lake Washington. Our two families don't see each other very often as we live in Squamish and they live in Idaho. But when we do see each other, the intervening years melt away and it feels like we were together only the day before. How do the years fly by so fast? Nancy, Paige, Molly, Paula, Fran and Dominic. Seattle 1989. Paula, Paige, Dominic and Molly. Seattle 1990. ...and now they look like this? Paula, Paige and Dominic. Vancouver 2014. Honestly, it seems like the photo below was taken last week but it was taken 21 years ago! Paige, Marie, Molly, Paula, Will and Dominic. Mount Vernon 1993. The Sothams and the Trevisans. Squamish 1994. ...and now we look like this. The Sothams and the Trevisans. Vancouver 2014. Congratulations, Dominic! Thank you for inviting us to share in your celebration. It was wonderful to see you and your family. Please keep us in mind when you graduate with your PhD! I went on a long walk with three friends in the morning, I watched an episode of my favourite television show 'Project Runway' in the afternoon and Joe's cousin invited us to join them for a Thanksgiving dinner in Whistler for the evening. Just how did I get so lucky on a Saturday? Me and my favourite canine. We had a wonderful time in Whistler with Joe's cousins and their friends. I love meeting new people at parties. The food was out-of-this-world delicious, the conversations were thought-provoking and interesting, and it was so much fun to sit around a table chatting and eating with thirteen other people, most of whom I had just met. 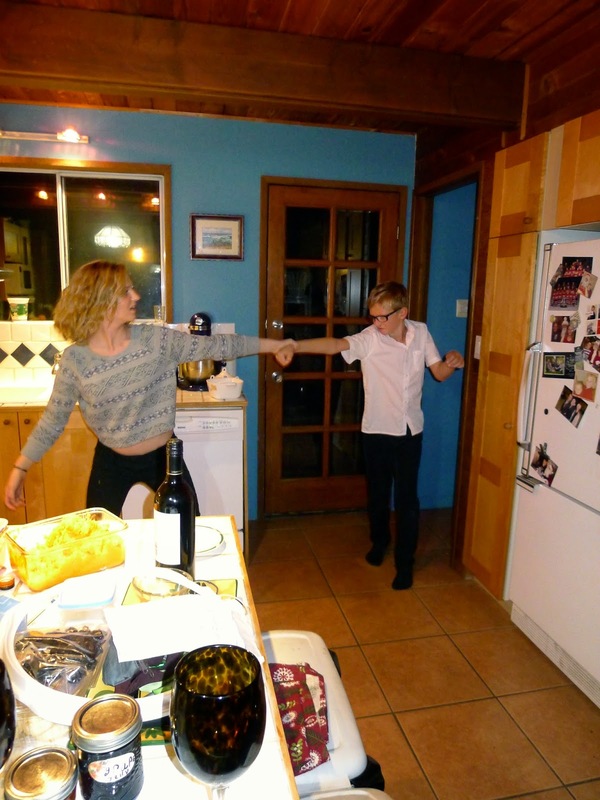 No Thanksgiving feast is complete until two of the younger cousins jive in the kitchen. And no jive is complete without dipping one's partner at the end of the dance. A huge thank you to the Clarks and Grants for having us for our first Thanksgiving dinner of the weekend. We always enjoy our time with you. We are so happy we are family. Sunday was our turn to cook. And by 'our' I mean Joe's. Paige, her boyfriend Jordan and my mom arrived mid-afternoon. Jordan arrived guitar in hand and serenaded us with old songs and new, contemporary and gospel, country and blues. What a great way to spend a rainy afternoon. I can't remember what they were singing but they sure were having fun with it. A turkey dinner has GOT to be one of my most favourite meals. I never tire of it. Never. We took this photo to send to Molly, our far-away girl in Toronto. We miss her. Her absence is keenly felt during the holidays. Joe put on an incredible breakfast spread. Baked ham, scrambled eggs, fried potatoes, crepes and mimosas. How he does it is beyond me. If breakfast were up to me, we'd be eating Lucky Charms out of the box. Our three overnight guests left mid-morning and Joe laid down for a well-deserved rest. The majestic Stawamus Chief in the rain. Later on in the afternoon we went for a walk at the tip of Howe Sound and reflected on our Thanksgiving weekend. We both agreed we had lots to be thankful for. Family, friends, food, music and fun topped our list. Thank you to everyone for contributing to our wonderful Thanksgiving weekend. We are grateful for you all.